An ever-changing horizon continually breathes new experiences and within those we truly live in the moment, we are gifted with the present. We often postpone travelling with the intentions of ‘becoming a responsible adult’ or ‘building up a real life’. Some people say they are saving the occasion for retirement. However, if we don’t live to our forties, fifties or sixties, we can safely say that we have no regrets. The decision to buy experiences rather than material objects has changed us in so many ways that we are genuinely grateful for. It is only natural for us to paint a picture in your mind of what your destination will be like and the experiences we are likely to have. Most of the time, we are pleasantly surprised that it is even more beautiful than we imagined. I also had a picture of Peru in my mind, but what I experienced in reality was so much more real and vivid! 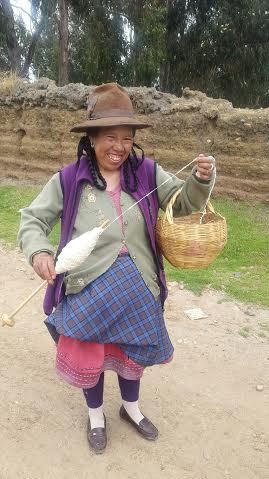 Peru is a country that you experience in extremity with all five (in fact, all six) your senses. You absorb the spirit of the country through your eyes; it is packed with treasures that visually stun. The Peruvian cuisine indulges the taste buds and is like an explosion of flavours in your mouth. The thundering avalanches and honk-honk-honk of the cars and tuk-tuk’s in the cities are sounds you will never forget. The distinct aromas in the villages will linger in your nostrils for days and the sensations you feel is plenty to last a lifetime. Best of all, the thrilling anticipation of what you will find around the next corner. A single trip is not enough to discover all the wonders of Peru. 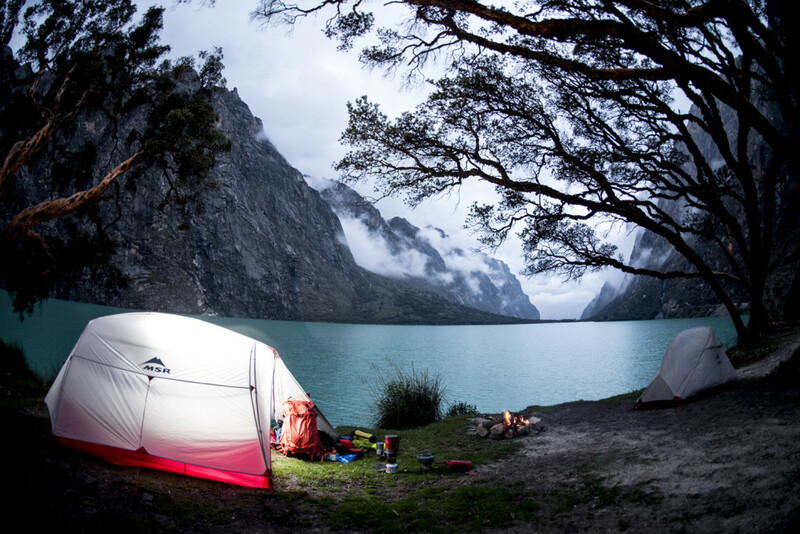 Peru is versatile and its geography proves it the perfect place for adventure. A warm desert coast, an imposing mountain range and a lush jungle invites you to enjoy all kinds of extreme experiences and adventures including hiking in the mountains, sandboarding on coastal dunes and canoeing in rivers or trekking one of the many trails. 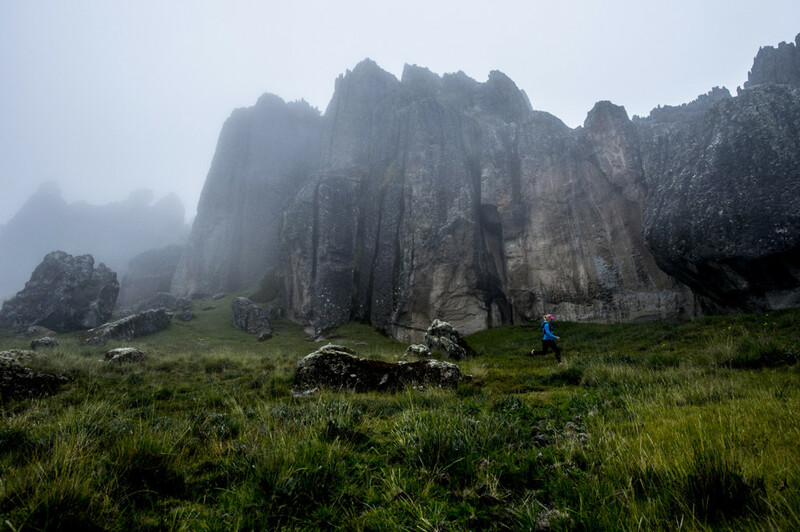 As I have a real love for running in the mountains, my adventure happened to be one of running through this breathtaking geography. I wanted to have a little taste of how the Incas lived in harmony with the rivers, the sun, the rain, the ocean, the jungle, the Peruvian mountains and the cold dryness of the Andes, consequently adapting to the weather, their surroundings and surviving thanks to Mother Earth’s gifts. At the present, part of this ancient society still lives in each town and can be seen through the customs of the people. A trip to Peru takes you back in time and allows you to rediscover the exciting lives of these ancient societies such as the Incas, Chancas, Chachapoyas, Mochicas, and Wari, as well as their great works of art, their feasts, the roots of their social strength and the energy of their people. My first adventure in Peru was a project for Kia Motors Global alongside renowned adventure photographer, Craig Kolesky, who captured the beating heart of this journey. It was indeed a difficult decision to choose the area for this project, but ultimately we decided on the Highlands. This is one of the mountainous region of Peru, where the Andes mountain range dominates the landscape and contains various ecological regions and altitudes. The northern Andes is lower and more humid than the rest, while the central Andes is the tallest and steepest, and it is here where you find the country’s highest peak, Huascarán, at 6,768 meters above sea level. The southern Andes is wider, and are also known as the altiplano, or high Andean plateau. During the day, temperatures can reach 24°C, and at night they can fall to -3°C. The idea was that we would essentially plot a route on the map for each day’s run. Craig would then drive to the various locations, where he would track me down with his lens on foot. 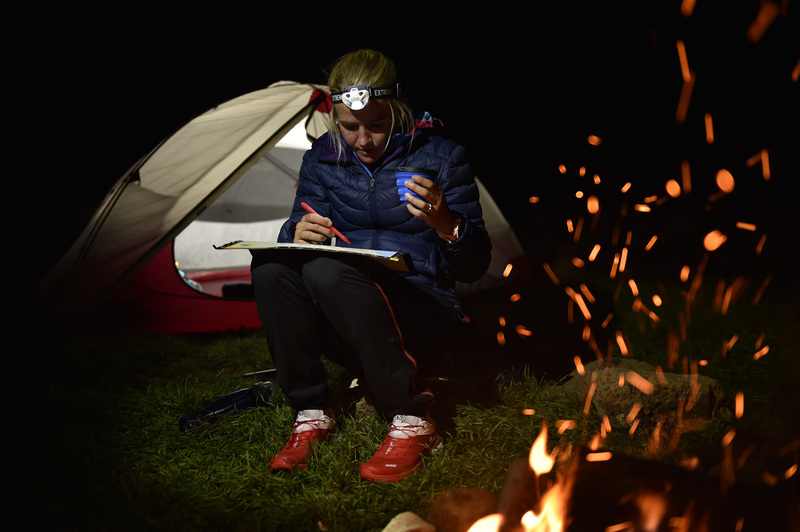 His duties also included locating the most beautiful, remote camping spots in the designated areas. 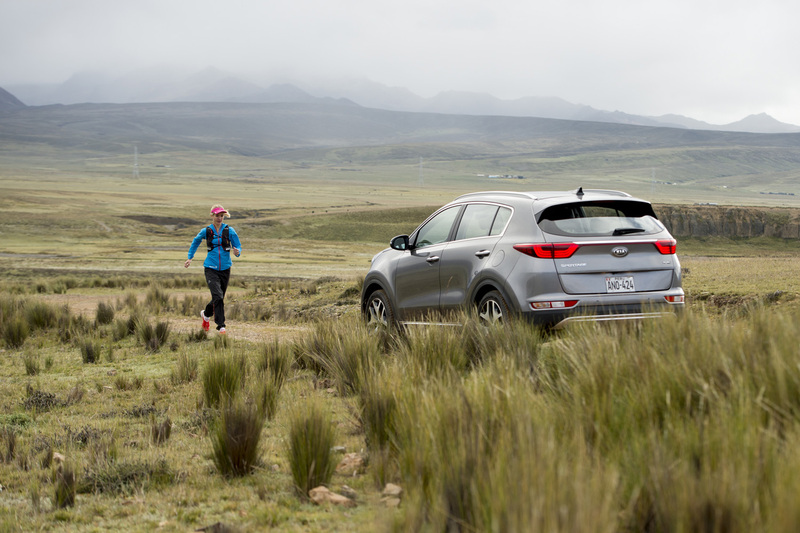 The first day’s journey explored the vast, rugged terrain of the Chinancocha region in the Huascaran National Park. Some of the culminations I experienced included introducing myself and my Garmin Fenix 3 to an altitude of 4100m for the first time, galloping along with a heard of about sixty Alpacas and watching a local Peruvian lady cooking fried corn ker nels and tasting these delightful treats. 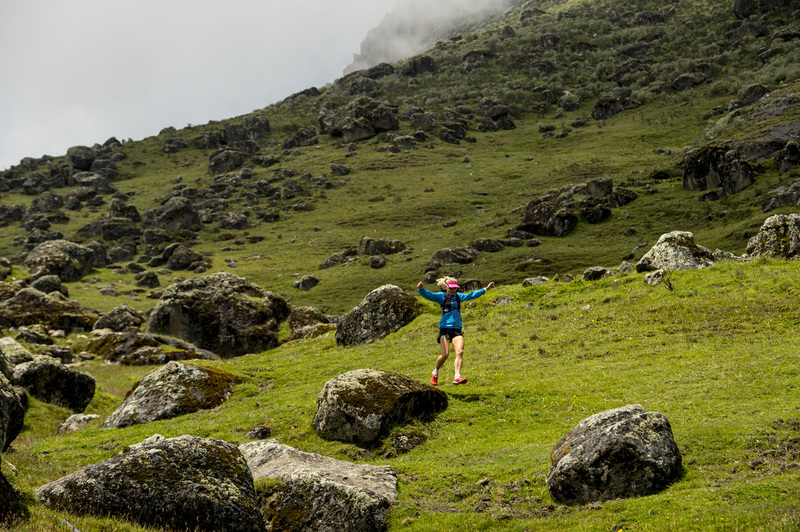 One of the more terrifying moments was very nearly being attacked by a couple of local dogs (or “peros” as they are known in Peru) on my way to the most beautiful ridgeline. Fortunately, I kept calm (after initially freaking out completely!) and was unharmed, but this continued to be a problem when running through some of the local villages in Peru. 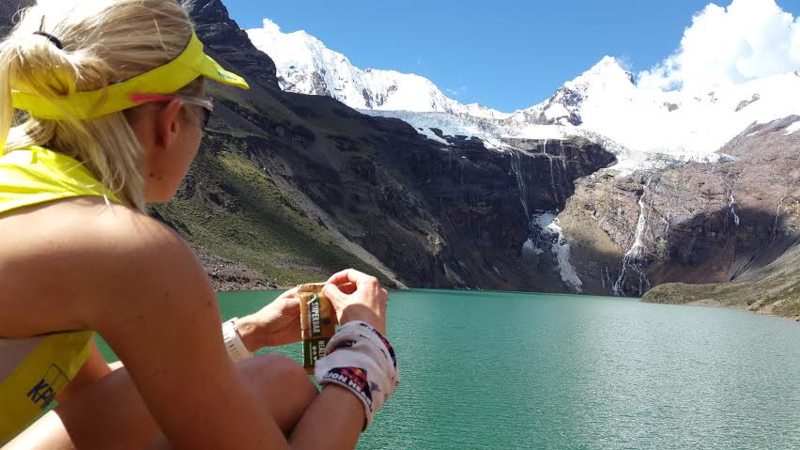 Peru certainly has mountains of immense proportions. 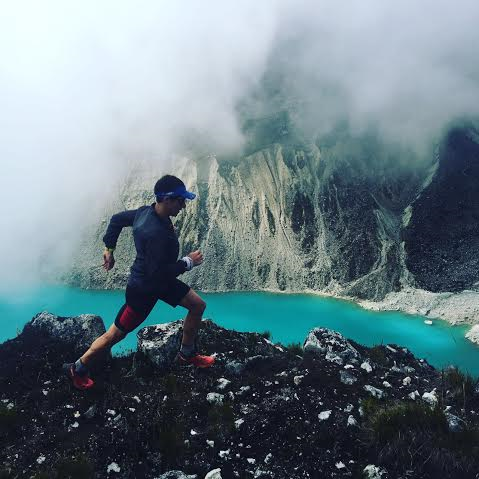 Day two’s mission was to set off on the trail to ‘Laguna 69’, one of the most beautiful sights in Peru’s Cordillera Blanca. Laguna 69’ is a breath-taking turquoise lake that is literally hugged by snowy mountain peaks, jagged rocks and trickling waterfalls some 4,600 metres above sea level. 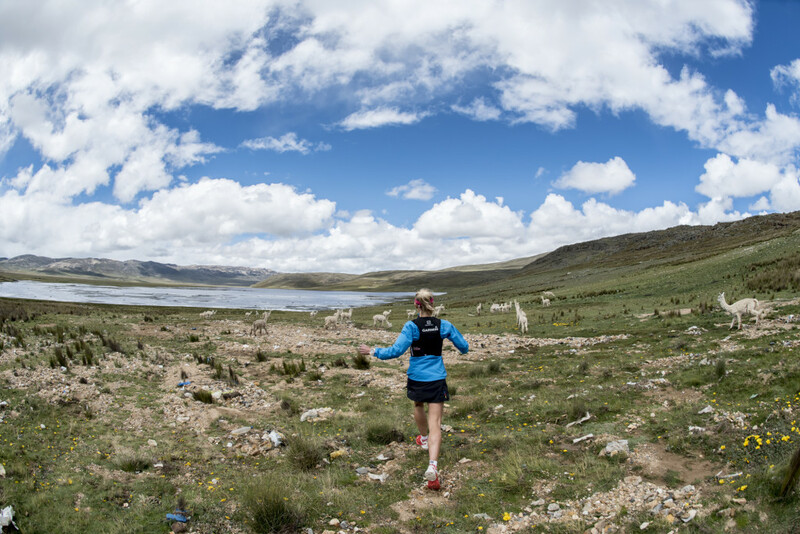 It is both a steep and demanding ascent beginning at 3,800 metres, but the overriding challenge is being able to cope with the high altitude. Most striking is the sight of the massive Huascaran that dominates the skyline. At 6,768 metres, it is the highest peak in Peru. Another challenge was the weather. Experiencing four seasons in a day is an understatement! From wind and rain to sunshine, my waterproof Salomon Bonatti jacket was on then off in a continuous cycle. 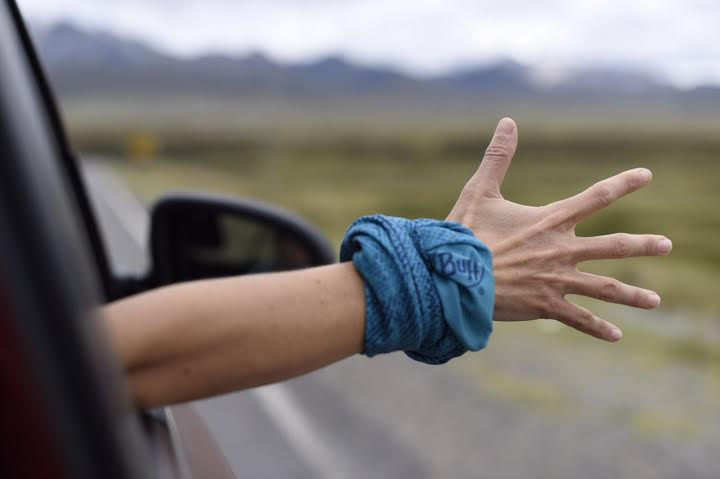 Running is this awe-inspiring environment, crossing natural bridges over crystal-clear turquoise water and camping under the stars next to this blue paradise was truly unforgettable. 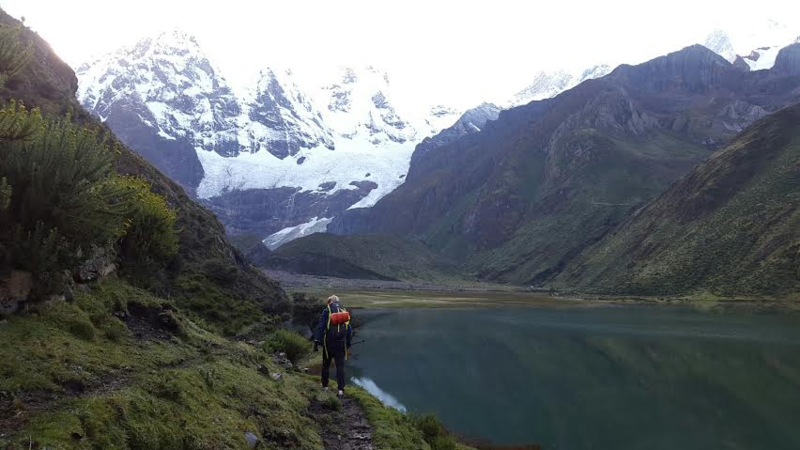 On my final day with Craig we cherry-picked a place near the city of Huaraz, known as Hatun Machay, famous for rock climbing and a hiker’s paradise, located at 4267m. I recall running through gigantic rocks of about 10 metres high and discovering intriguing rock-paintings of alien look-alike creatures. Craig and I enjoyed a hearty home-cooked meal by the friendly owner, Migual Aquillar. 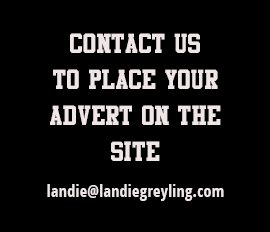 We concluded our adventure by camping in freezing conditions, but as good fortune would have it, our superb gear and a remarkable full moon made it all worthwhile. 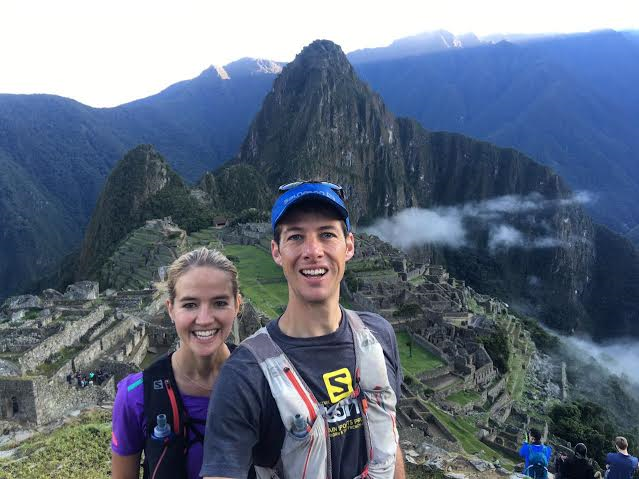 I was thrilled that Christiaan would accompany me for the second part of my Peru journey. I spent a couple of days recouperating and training at Hatun Machay and was treated like royalty with three home-cooked meals every day until Christiaan’s arrival. 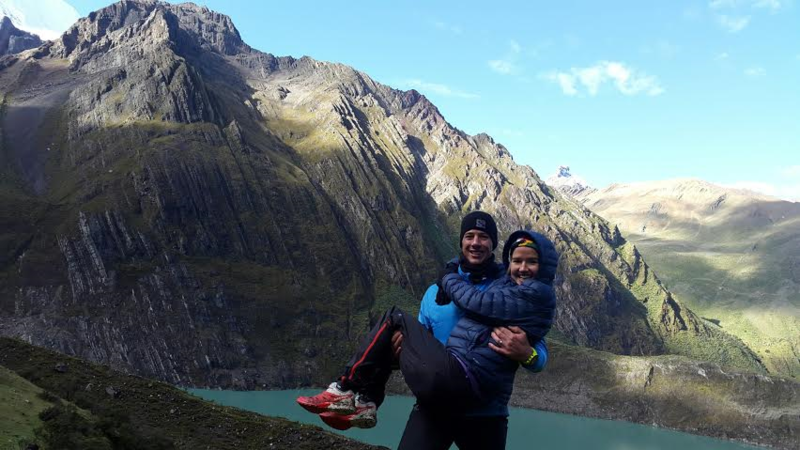 Our first quest included running a section of the legendary Cordillera Huayhuash Trek, which is known as one of the finest treks in the world. After a three and a half hour drive on one of the most remote dirt roads, we started our trek from the far-off town of Llamac. We initially struggled to find the start of the trail (it really felt as if we were in a ghost town), but luckily we found a local who directed us to the trailhead, where we set off on a major climb of about 1000m. We had nothing but our backpacks filled with the essentials as we ventured into the great outdoors, without access to the usual facilities and objects we might usually take for granted. Being used to lightweight running packs, our heavier backpacks were a slight shock to the system, complete with our little one-man tent (weighing only 800g thanks to Craig Kolesky and MSR), sleeping bags, matrasses, food, plenty of warm clothes and cooking utentils (which no doubt included our little Bialetti to brew our beloved Hazz coffee). 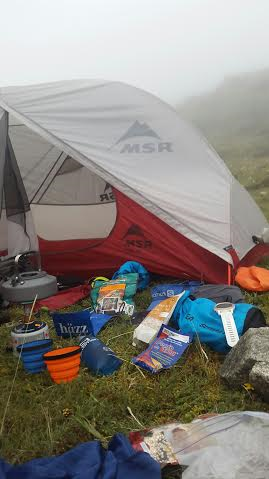 We hoped to pitch our tent before dark, but eventually had to dig out our Extreme lights to find a camping spot. Knackered after a long day, we both fell asleep before 8, which resulted in waking up at 4am in the fine company of a rushing waterfall, snowy peaks and the delightful full moon. Another highlight of this trip was the magnificent sound and sight of thundering avalanches while enjoying a picnic alongside picture-perfect scenery of a turquoise lake and colourful mountaintops. We also reached our highest point of 4750m on the major climb of the day. Enjoying a healthy snack – Superbar! Our next exploration included a one-day run from Pitec to lake Tulpacocha and back. We opted for a 45min taxi-drive to Pitec to avoid any unwanted encounters with the infamous “peros”… The surroundings and footpath were delightful: Free running at its finest, bolting across wooden bridges, abundant amounts of fresh water and best of all, no sight of any other humans, only wild horses and plenty of cows. As we ran over the final ridge, a glimpse of turquoise-green came into view. 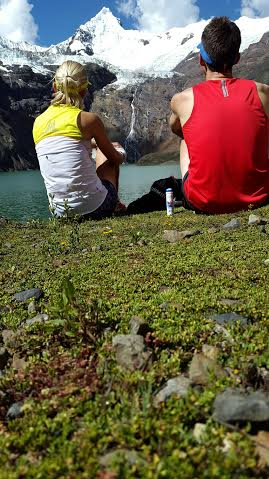 We had reached our picnic spot – the beautiful lake Tulpachocha! After snacking on a Superbar and some Buttanut, we headed back to Pitec where our taxi driver was waiting patiently for our return. From here, we ventured on to the well-known Cusco region. 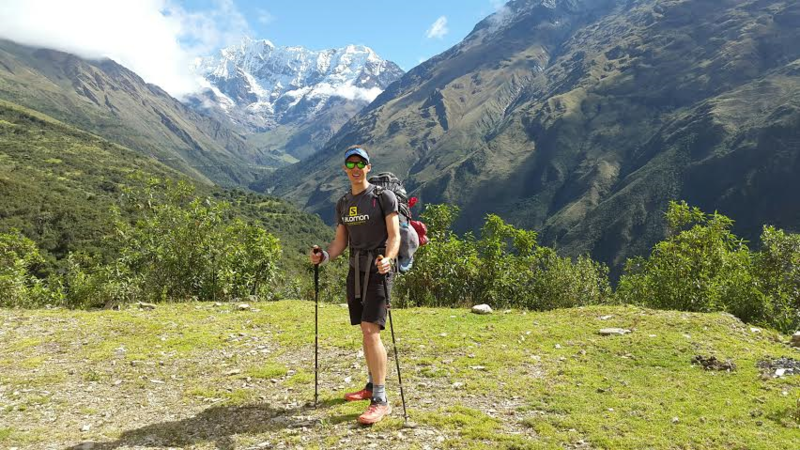 The plan was a self-supported journey on the Salkantay Trek to the legendary Machu Picchu. So once more, we filled our backpacks with all the necessities, took a taxi from Cusco to Cruzpata where we bumped into a Spanish couple who were also looking for further transport to the start of the trek. We managed to convinced them to convince our taxi driver (who only spoke Spanish) to drive us further up the road in his small car (which was certainly not suited for that poor road). Eventually, he would go no further and dropped us off near a very remote place called Mollepata. We had no choice but to start our expedition from here and finally reached the steep pass up to the snowy Salkantay peak. Once at the top, we spotted a little trail that veered off the main route. Of course our inquisitiveness led us straight there. The discovery – another breath-taking even more turquoise lake! 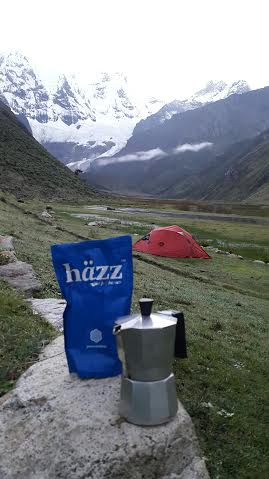 This was also so the perfect opportunity to brew a Häzz coffee and enjoy a quick lunch. Two more hours of mostly downhill running brought us to our campsite next to a beautiful river with lush green grass and not a sole in sight. The following day another 25km on foot and a couple of taxis brought us to the quaint little village of Aguas Calientes, the base to reach Machu Picchu. The idea was to head up to Machu Picchu first thing in the morning as the gates only opened at 6am. We checked in at a decent and affordable backpackers, went sightseeing, had dinner and shopped at the local markets till late. Machu Picchu surely had to be the ultimate highlight at the end of our trip. We felt like little kids exploring around every corner and running through all the mazes. The architecture and ruins of the Incas are truly mind-blowing. We could not stop taking pictures! 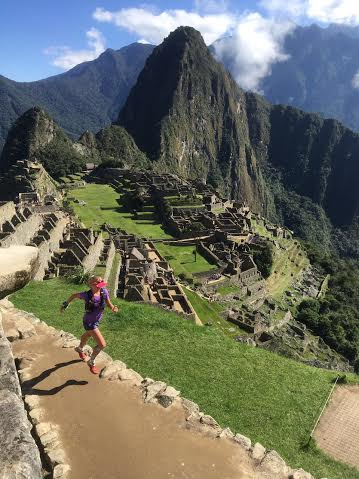 Exploring Machu Picchu Greyling style! We returned to Cusco for one night before flying to Lima, the capital of Peru, where we would spend our final night before returning to South Africa. We rewarded ourselves with one last run along the beautiful coastline with a spectacular sunset. Later that evening we appreciated a Cusquena (very tasty local beer) and a mouth-watering native dish of veal, egg and mashed beans. And so, our life-changing, unforgettable journey came to an end. 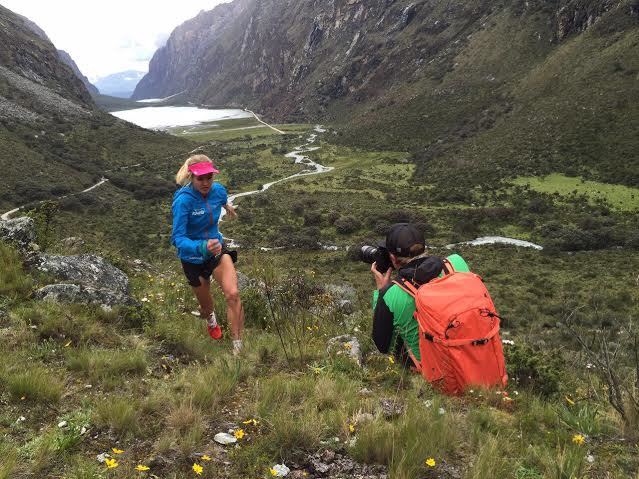 … What more can I say about Peru: It left me speechless… but now turned me into a storyteller. I truly hope that you get visit this unique destination one day! The plan is to organize an adventure trip of this nature in 2017, so be sure watch this space!